Keeping up with a vigorous beauty regime is both expensive and time consuming, I am always looking for new ways to cut down on costs, but not willing to compromise on the quality of products I use. 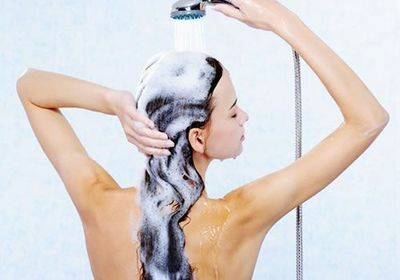 So when I heard that shampoo was in fact having adverse effects on my hair – there can be up to 4000 chemicals in a simple fragrant shampoo – I decided I needed to find a cheaper alternative. I have THE most difficult hair. It is frizzy in the heat, frizzy in the rain and frizzy in winter. It has a ridiculous cow-lick at the front where my hair insists on parting and I constantly struggle with finding a cut that suits my face and keeps my hair somewhat controlled. So when I heard about going poo-free, and the benefits of letting your natural oils come through, I had to give it a go. Here is what I discovered. When we use shampoo it strips our scalps of natural oils, which tends to increase oil production, so when I stopped using shampoo every day I found that my hair seemed oilier than normal. But after a few weeks of using this method my hair has calmed down a lot and I’m loving it! It’s smoother, easier to style and has a natural shine that I could never achieve with my shampoos. I still shampoo, but only once a week, and I use Aveeda which is natural and doesn’t include some of the nastiest chemicals. The rest of the time it’s baking soda and Apple Cider Vinegar. These remedies help minimize the oil and keep hair looking healthy and shiny. Mix 1 part baking soda to 3 parts water. I have shoulder length hair and use 2-3 tablespoons of baking soda and 3 times the amount of water. If you put it in a squeeze bottle it’s much easier to apply. You can apply to wet or dry hair, starting at the roots and working down. Leave in for 2-3 minutes before washing out. Mix 1 part ACV to 4 parts water. ACV has a strong smell so I add an essential oil like lavender or peppermint. Just pour it through your hair using a squeeze bottle. You don’t need to leave it in for too long, a few seconds will do the trick. I rinse it out with cold water to seal in the moisture, smooth the hair and add shine. I have noticed a huge difference in eliminating the frizz and the odd flyaway that were once my daily battle. Have you tried this method? How did you go?